Gambler’s Multiplier™ is played at player’s choice anytime a win of 10 or more credits has occurred in a base game. Game starts with a standard deck of 52 cards. First card drawn is the comparison card, second card drawn is the result card. Before the result card is drawn, player guesses if it will be higher or lower than the comparison card. If player guesses correctly, they are awarded a random multiplier or a spin of the credit wheel, if they guess incorrectly, they lose their winnings and the game is over. At the end of each winning round, player may choose to leave the game with their current winnings, or continue on for another round. Each comparison card has a probability that the next card will be higher and a probability that the next card will be lower. The outcome with a lower probability (higher risk) is awarded a higher average multiplier, where the outcome with a higher probability (lower risk) is awarded a lower average multiplier/credit wheel spin. 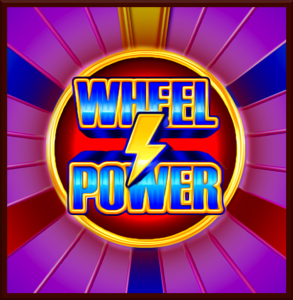 Wheel power is a bonus module that allows players to win both multipliers and the chance for extra spins. The concept uses two (2) wheels in one with multipliers on the first reel spinning left to right, and resin awards on the second wheel, spinning right to left. Wheel power is initiated by the wheel power symbol appearing anywhere on the first and last reel of the base game.